Yoshiyuki Tomino (富野 由悠季, Tomino Yoshiyuki, born 富野 喜幸 November 5, 1941) is a Japanese mecha anime creator, animator, songwriter, director, screenwriter and novelist. He was born in Odawara, Kanagawa Prefecture, and studied at Nihon University's College of Art. He is best known for creating the Gundam anime franchise. Tomino, began his career in 1963 with Osamu Tezuka's company, Mushi Productions, scripting the storyboards and screenplay of the first Japanese anime television series, Tetsuwan Atomu (also known as Astro Boy). He later became one of the most important members of the anime studio Sunrise, going on to direct numerous anime through the 1970s, 1980s and 1990s. Tomino is perhaps best known for his transformation of the "Super Robot" mecha anime genre into the "Real Robot" genre with 1979's Mobile Suit Gundam, the first in the Gundam franchise. He has also won numerous awards, including the "Best Director" award at the recent 2006 Tokyo International Anime Fair (for the 2005 film Mobile Suit Zeta Gundam: Heirs to the Stars). Two anime series directed by Tomino (Mobile Suit Gundam in 1979– 80 and Space Runaway Ideon in 1980) won the Animage Anime Grand Prix award. Tomino is known for using numerous pseudonyms for miscellaneous staffing roles that he performs in his works, including Minami Asa (阿佐 みなみ, Asa Minami) and Minoru Yokitani (斧谷 稔, Yokitani Minoru), which are used to credit himself for screenplays and storyboards he creates, Rin Iogi (井荻 麟, Iogi Rin), which he uses to credit himself for theme song lyrics he writes. Tomino (as Iogi) has collaborated with artists such as Yoko Kanno, Asei Kobayashi, MIO and Neil Sedaka. 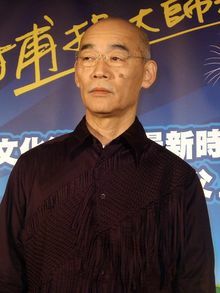 Tomino is noted for directing several well-known anime series throughout his career, such as his most notable work, the Mobile Suit Gundam series, beginning in 1979, and which was later followed onto numerous sequels, spinoffs and merchandising franchises, Aura Battler Dunbine, Brave Raideen (in which he directed the first 26 episodes), and numerous others. His newer work includes Brain Powerd (1998), Turn A Gundam (1999), Overman King Gainer (2002) and most recently, Gundam Reconguista in G (2014). Tomino made his directorial debut with 1973's Triton of the Sea (海のトリトン, Umi no Toriton). This show, loosely based on Osamu Tezuka's manga Blue Triton, showed a different perspective than the traditional "good vs. evil" show. The star, Triton, a 10-year-old boy, is the last survivor of the Tritons, a tribe from Atlantis that was wiped out by the "evil" Poseidons. However the viewers learn later on that the story was not so black and white after all. In 1975, Tomino worked on Brave Raideen, his first mecha work, in which he directed the first 26 episodes. Raideen was renowned and influential in its innovative portrayal of a giant machine of mysterious and mystical origins, and has gone on to inspire numerous other directors and series, including Yutaka Izubuchi's 2002 series, RahXephon. Tomino also later worked on 1977's Voltes V.
While many of the series Tomino has directed throughout his career contained an upbeat and positive tone, in which the majority of the protagonists survive, a number of his shows during the early years of his career (the late 1970s through early 1990s) contained endings in which a significant number of characters and protagonists died. In 1977, Tomino directed Zambot 3. Certain sources cite this series as the origin of a nickname used by some anime fans, "Kill 'Em All Tomino" (皆殺しの富野, Minagoroshi no Tomino), due to the high number of character deaths (although Tomino had directed and worked in a number of series in which the vast majority of the protagonists survive). With its new, realistic approach to giant robots, Gundam changed the face of mecha anime and split the genre into two. Single-handedly inventing the "Real Robot" subgenre, Gundam forced all of its predecessors to be redefined as part of the "Super Robot" subgenre. Not surprisingly, Real Robots became all the rage after Gundam. Shows such as Combat Armor Dougram and Walker Machine Xabungle followed the trail Tomino had blazed. The bottom line is, I wanted to have a more realistic robot series - unlike a super robot - where everything is more reality-based, based on a humanoid robot. Right from the beginning, the roots of the mobile suit came from the worker robots that were building the space colonies back then, and they would become more technologically advanced, to the point of becoming a weapon, and that was the whole lineage of the robots I had in mind since the beginning. So the whole idea, my idea, of trying to have a robot series in space without it becoming a stupid story was based on wanting to make a story and surrounding it with reality - more realistic possibilities was the underlying concept. Although the last quarter of the show's original script was canceled and it had to be completed in 43 episodes, its popularity grew after three compilation movies were released in 1981 and 1982. Mobile Suit Gundam was followed by numerous sequels, spin-offs and merchandising franchises, becoming one of the longest-running and most influential, popular anime series in history, being chosen as No. 1 on TV Asahi's "Top 100 Anime" listing in 2005. In 1980, Tomino directed Space Runaway Ideon, a series which like Mobile Suit Gundam was cancelled on its initial run, but featured movie versions later on. The series is known for its darker story elements. Tomino followed up with a more light-hearted spin-off called Xabungle, but the darker nature of Ideon continued with 1983's Aura Battler Dunbine. In 1984, Tomino released Heavy Metal L-Gaim. The following year, Tomino directed the first sequel to 1979's Mobile Suit Gundam, Mobile Suit Zeta Gundam. Tomino's involvement in the following Gundam series, 1986's Mobile Suit Gundam ZZ created an upbeat, comedic theme whereas the earlier Gundam's are of a darker theme. In 1988, Tomino concluded the saga begun in Mobile Suit Gundam with the Gundam motion picture Char's Counterattack. Tomino would direct an additional Gundam motion picture, Mobile Suit Gundam F91 in 1991. This movie, which took place 30 years after Char's Counterattack, re-launched the Gundam saga in a new direction by featuring a completely new cast. In 1993, Tomino directed his next Gundam series, Victory Gundam, which (like F91 before) attempted to relaunch the Gundam saga with a completely new cast. In 1996, Tomino wrote and directed Garzey's Wing, and in 1998 wrote and directed Brain Powerd. In 1999, he returned to Gundam with Turn A Gundam and in 2002, directed two compilations movies for it entitled Turn A Gundam I: Earth Light and Turn A Gundam II: Moonlight Butterfly. Also in 2002, he directed Overman King Gainer, and in 2005, Tomino directed 3 compilation movies summarizing the events of 1985's Zeta Gundam. His last major original work in the 2000s was the 6-episode OVA The Wings of Rean, which first premiered on the Internet across Bandai Channel, the broadcast beginning from December 12, 2005 with the final episode starting on August 18, 2006. Also in 2006, Tomino made a special cameo appearance in Shinji Higuchi's tokusatsu film Japan Sinks. At the 2009 CESA Developers Conference, Yoshiyuki used his keynote speech to criticize the gaming industry, citing that video games "bringing no productivity at all" and that "consoles are just consuming electricity", while stressing that game developers need to focus more on quality content rather than advanced technology, comparing it to the modern animation industry. His surprising remarks have sparked mass discussions online. After working on the CGI short Ring of Gundam for Gundam's 30th anniversary in 2009, Tomino returned to the franchise again for its 35th anniversary in 2014 in a new work in which he wrote and directed, Gundam Reconguista in G.
^ "Tokyo Anime Fair: Award Winners", Anime News Network, 27 March 2006. ^ a b Machiyama, Toma (December 2002). "Interview with Yoshiyuki Tomino - The creator of Gundam, before & after!". Animerica. Vol. 10 no. 12. pp. 40–41. ^ "Profile: Tomino Yoshiyuki". AnimeAcademy.com. Archived from the original on June 18, 2007. Retrieved 5 August 2007. ^ ロボットアニメ万歳 (in Japanese). Archived from the original on 28 February 2007. Retrieved 22 February 2007. ^ コラム (in Japanese). Mondo 21. Archived from the original on 24 October 2007. Retrieved 22 February 2007. ^ "Kill Em All Tomino". The Gundam Encyclopedia. Retrieved 5 August 2007. ^ Simmons, Mark (2002). Gundam The Official Guide. Seiji Horibuchi. p. 41. ISBN 1-56931-739-9. ^ Machiyama, Toma (2002). Animerica Volume 10, Number 12 Article. Seiji Horibuchi. p. 37. ^ "TV Asahi Top 100". Anime News Network. 23 September 2005. Retrieved 5 August 2007. This page is based on the Wikipedia article Yoshiyuki Tomino; it is used under the Creative Commons Attribution-ShareAlike 3.0 Unported License (CC-BY-SA). You may redistribute it, verbatim or modified, providing that you comply with the terms of the CC-BY-SA.